30 images available; click on one to open viewer. 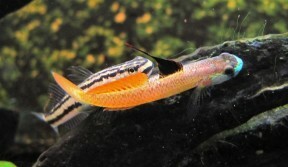 Dominant male specimen - yellow colour phase. 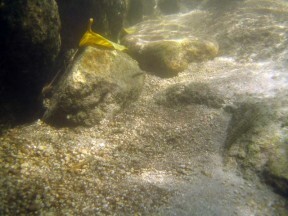 A typical habitat of Stiphodon spp. on Okinawa Island, Japan. Two males in their natural habitat, Okinawa, Japan. 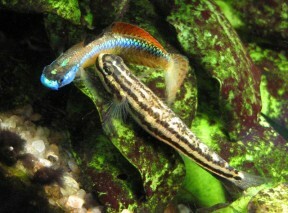 Two males sparring, Okinawa, Japan. 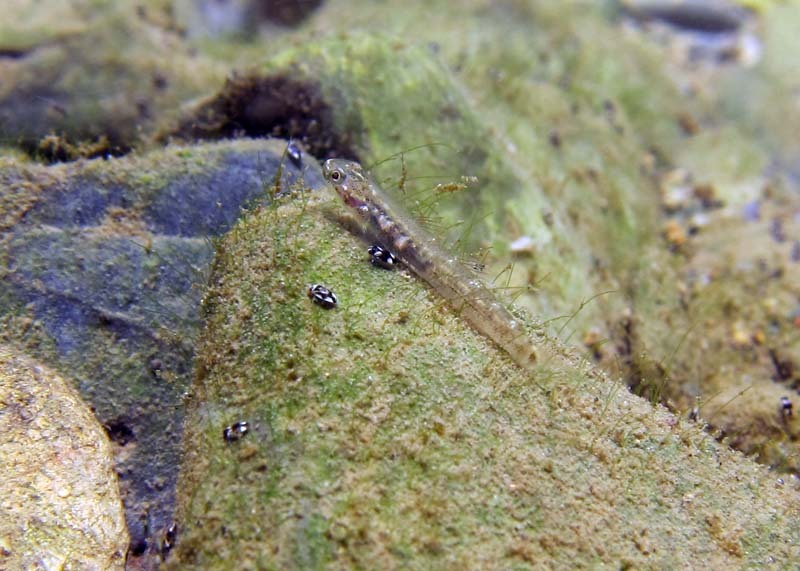 A male courts a female, Okinawa, Japan. 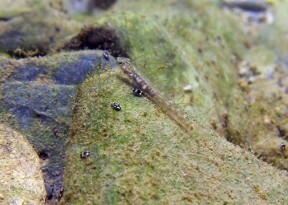 Young individual migrating upstream, Okinawa, Japan. 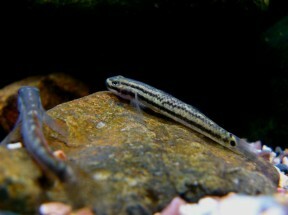 Gravid female in the aquarium. 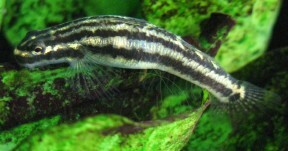 Ventral view of gravid female. 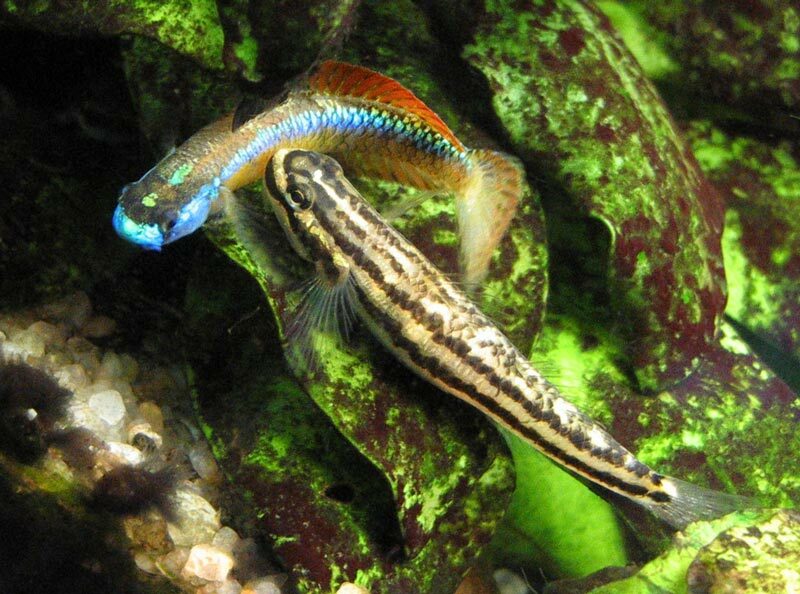 ...and receptive females respond by nuzzling his body. 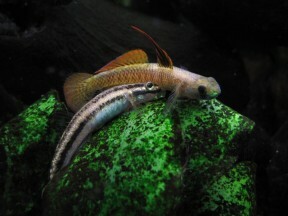 Males of both colour phases seem capable of spawning. 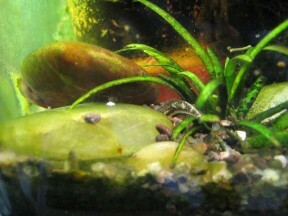 Finally, the pair dive into the substrate to deposit eggs and milt. 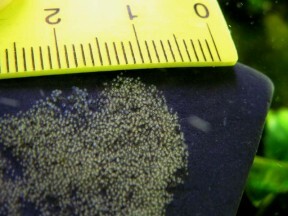 Hundreds of eggs can be deposited during a single spawning event. 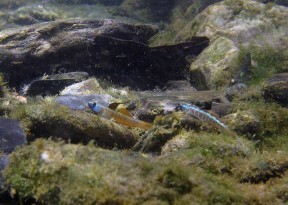 Males and females foraging, Okinawa, Japan. 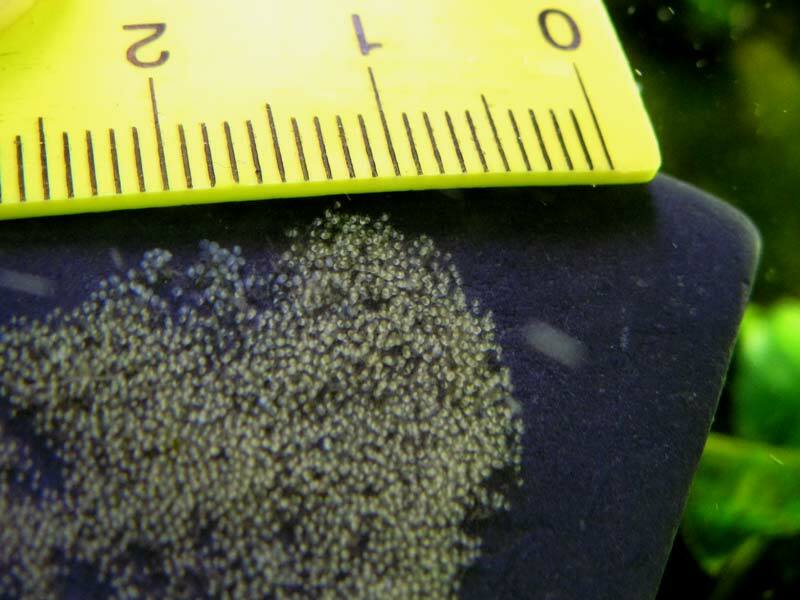 Non-reproductive females tend to form aggregations. Two subdominant males in foreground with dominant individual behind. Okinawa, Japan. 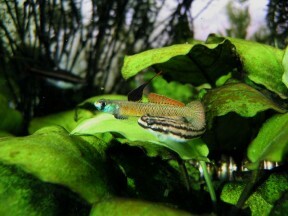 Male with almost full yellow phase colouration. 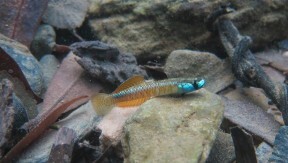 The same male exhibiting an intermediate colour phase with a higher degree of blue. A pair of S. percnopterygionus females. This fish is beginning to colour-up. 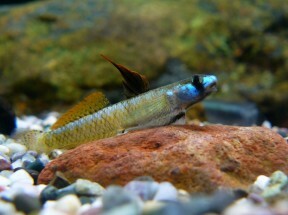 Another male exhibiting an intermediate colour phase but with a higher degree of yellow. 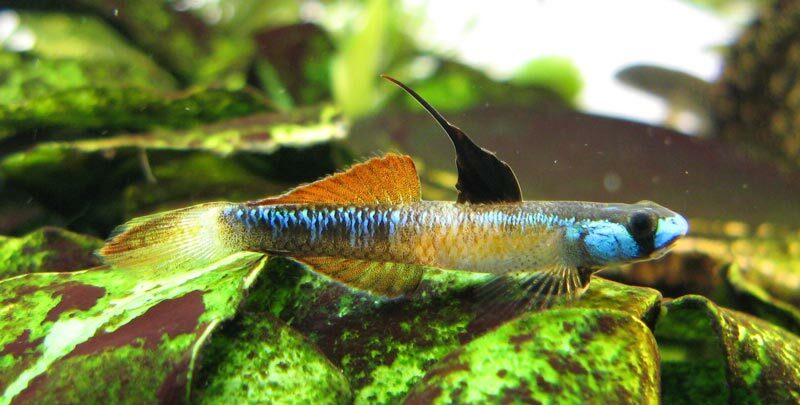 When first introduced to an aquarium males typically lose colour. This male has colour patterning intermediate between blue and yellow, and also appears stressed (red dorsal fin). 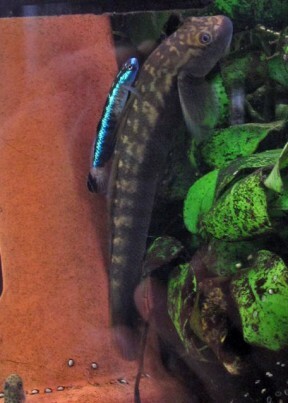 Dominant male S. percnopterygionus - blue colour phase. 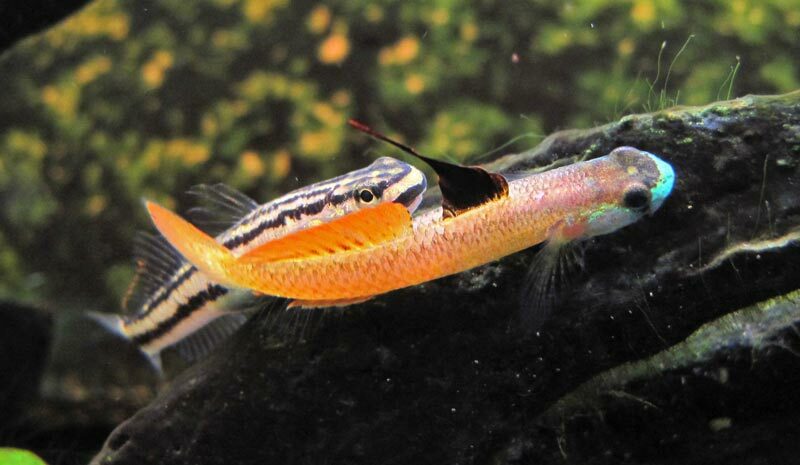 A male hitches a ride on the back of a larger Sicyopterus sp. Stiphodon: from the Ancient Greek στίφος (stifos), meaning ‘swarm, horde’, and ὀδών (odon), meaning ‘toothed’, in reference to the numerous, closely-packed teeth in the upper lip of member species. 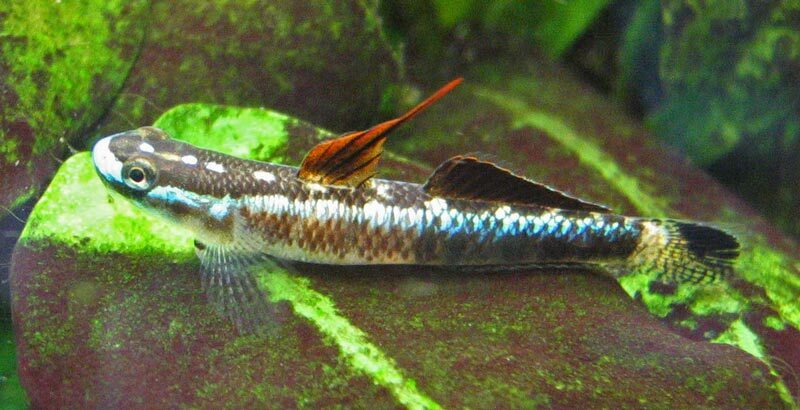 percnopterygionus: from the Ancient Greek περκνός (perknos), meaning ‘dark-spotted’, and πτερυγίων (pterygíon), meaning ‘fin’, in reference to the first dorsal-fin in males which is always blackish in colour. 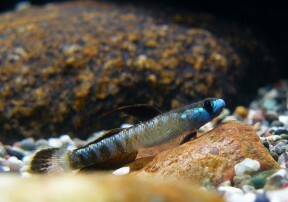 This species‘ known range extends in a rough eastward arc from southern Taiwan (Pintung and Taitung counties) through the Japanese island groups of Yaeyama, Ryukyu (in the latter it’s been found as far north as the Osumi Islands, close to mainland Japan) and Bonin with Micronesia representing the south-eastern limit. 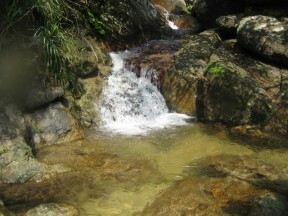 Type locality is given as ‘Nakama River, Yaeyama-gun, Iriomote Island, Okinawa Prefecture, Japan’. In Micronesia it’s been recorded from the Mariana Islands (only Guam as far as we know) and Babeldaob (aka Babelthuap) Island, Palau, and it’s distribution thus overlaps with that of several congeners, including S. atropurpureus. 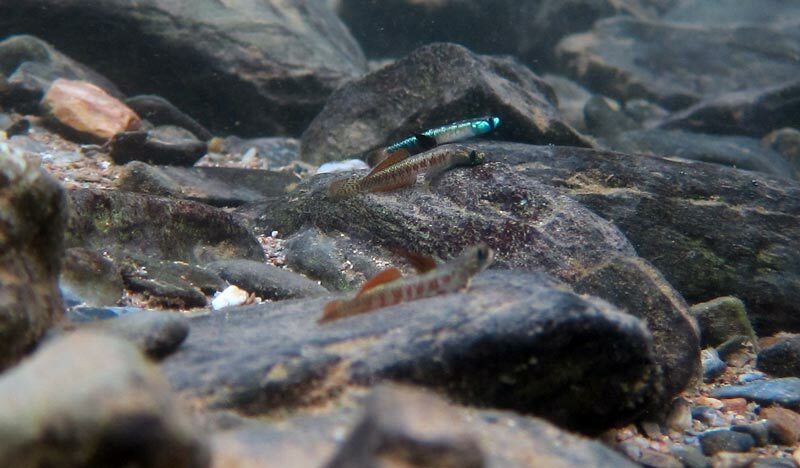 S. percnopterygionus falls into the latter group and typically occurs in low-gradient biotopes characterised by relatively wide, slow-to-medium flowing riffles or runs broken up by pools and small cascades in some cases. An aquarium with base dimensions of 60 ∗ 30 cm is big enough for a pair or small group but use something bigger if you want to keep multiple species together since males are territorial to an extent. 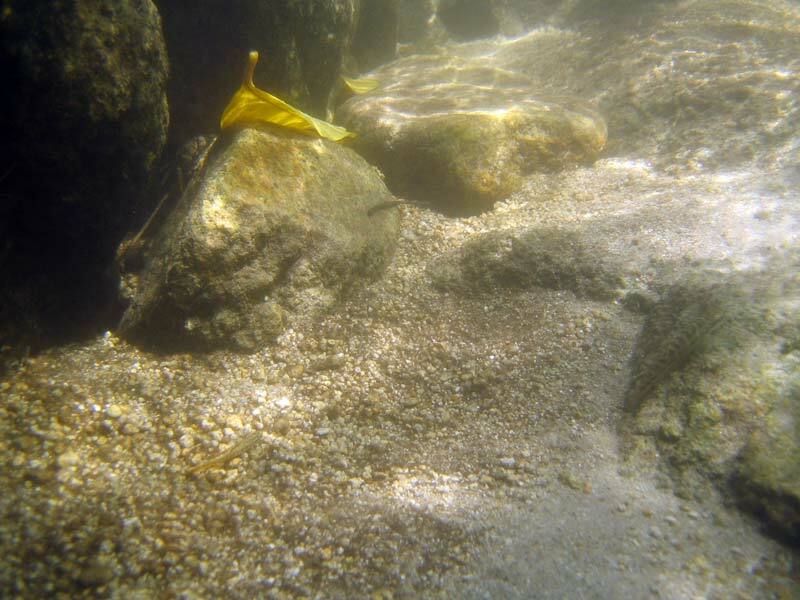 Temperature: 22 – 28 °C; increased surface agitation is needed to maintain dissolved oxygen levels towards the upper end of this range. 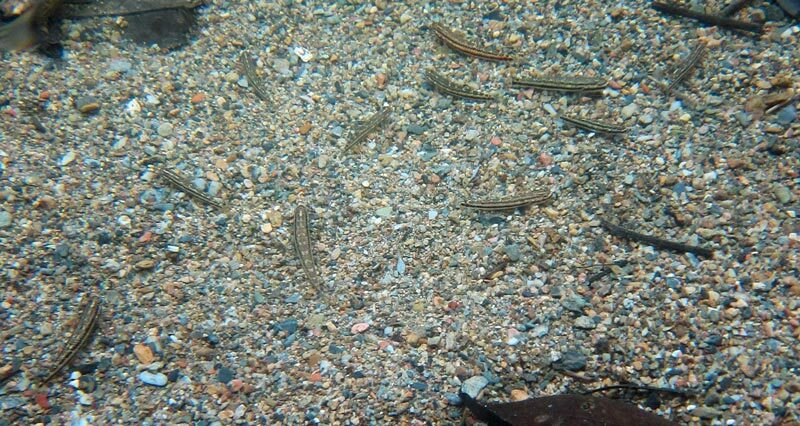 In nature this species undergoes a brief cool period between December and April during which water temperature drops to 59 – 66.2°F/15 – 19°C. 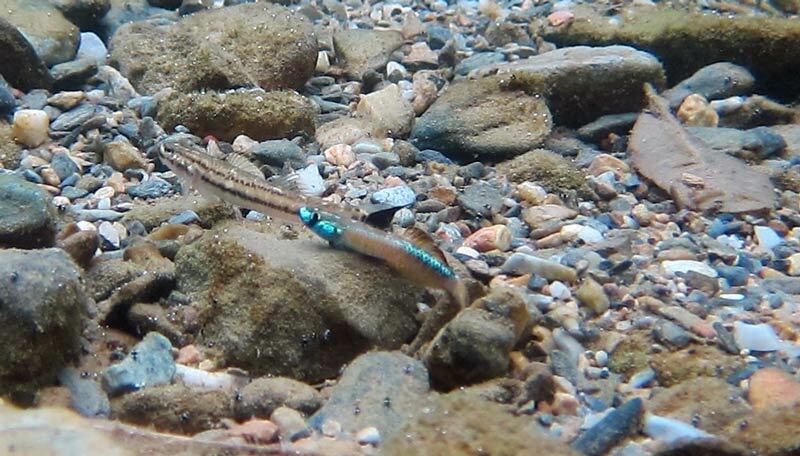 As with all members of the genus sexual dimorphism is pronounced; smaller males are predominantly blue in colour but most begin to take on a bright yellow to orange appearance once they reach around 25 mm SL. From aquarium observations some remain in this yellow colour phase for the rest of their lives, some revert to blue after a period and a few never develop yellow pigmentation. The reasons for this are unknown, and males of both colour phases are apparently able to breed. One common feature shared by all males of all sizes is a black first dorsal–fin, which may appear red if the fish is stressed. Females are relatively plain and similar in appearance to those of some other species, with a pale base colouration and two dark, lateral body stripes; the latter with rough, non-uniform edges but not containing any pale scales/patches. No dark-edged scales are visible on the flanks unless an individual is stressed or excited when the stripes pale considerably. 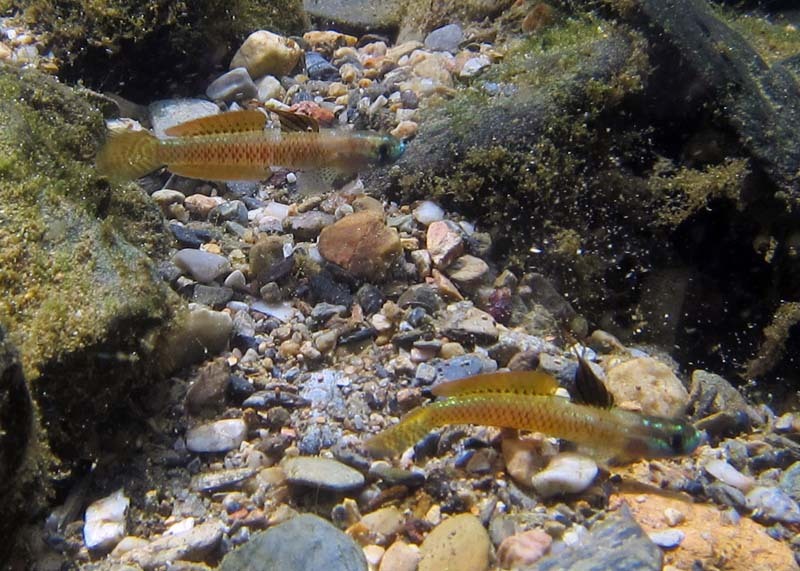 Two further series of dark markings extend from just in front of the eyes over the dorsal surface and are arranged in a roughly linear fashion as far as the first dorsal-fin where they merge, then continues as a single line of blotches to the caudal peduncle. 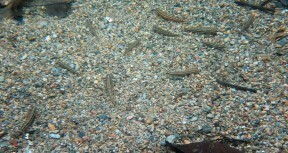 The finnage is generally clear but may contain a few small, randomly-distributed dark spots. 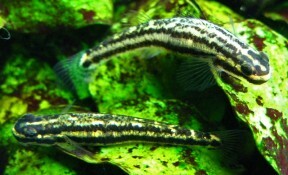 This species is rare in the aquarium trade and normally expensive when available. 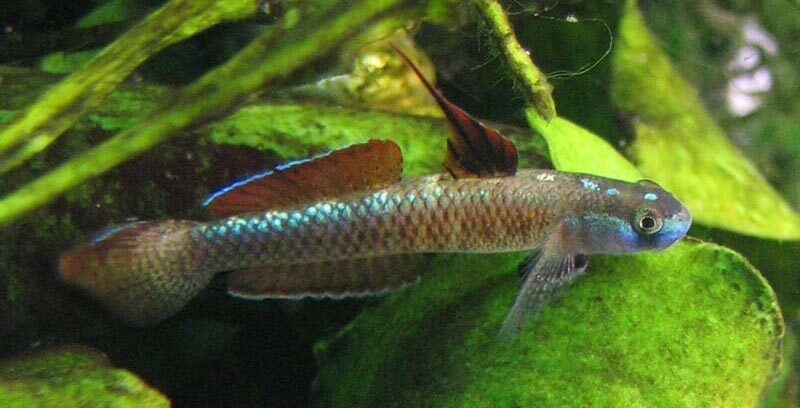 It’s among the most easily-identifiable in the genus via the unique combination of usually 14 pectoral-fin rays, 10 segmented second dorsal–fin rays, relatively small adult size, unique colouration in males and the shape of the first dorsal–fin in males in which the fourth and fifth spines are highly extended with the membrane connected along most of their length. 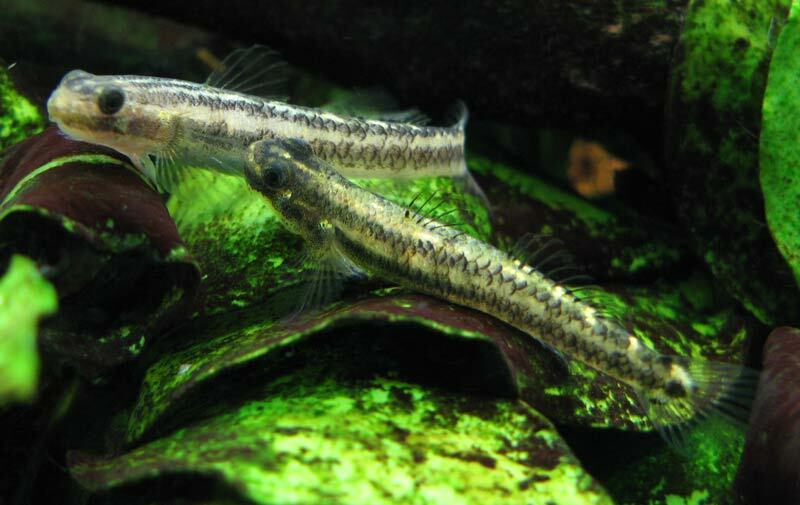 Freshwater gobies of the genus Stiphodon from Japan and Taiwan (Teleostei: Gobiidae: Sicydiini). Gobies of the genus Stiphodon from French Polynesia, with descriptions of two new species (Teleostei: Gobiidae: Sicydiinae).